Your weather data, your PC. What could be better? 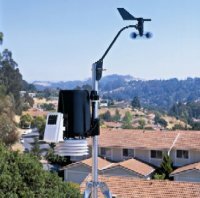 For the ultimate in weather monitoring, add WeatherLink® to a Davis station. Create graphs, calculate totals and averages, analyze trends, and more—all with your own weather database. Add to your Davis Instruments Vantage station or Weather Envoy, suggested for everyone from the home weather buff to the most demanding scientific user. Store weather data even when it's not connected to a computer. Later, download the data and use the software for detailed analysis and graphing. There are many model sub-variants, each with slightly differing features, connections and specifications. WeatherLink with standard data logger (6510USB,6510SER) is ideal for most purposes, while other models add special features designed for specific user groups. For more details, please refer to the Weather Station Reference Manaual. The WeatherLink data logger fits neatly into the weather station console or Weather Envoy, storing data even when it's not connected to your PC. Data loggers are not interchangeable. Be sure to choose the right version for your station.